Since I spotted Ceri’s recipe for pear, almond & kale smoothie over at Natural Kitchen Adventures, I’ve been making my own tweaked vegan version on a regular basis. It’s a complete delight and sustained me through most of Veganuary. This double pear green smoothie bowl was an iteration I came up with on the very last day and it’s even more fabulous made this way. The basic smoothie is almond milk, pear, kale, yoghurt and almond butter. I substituted vegan almond yoghurt for Greek yoghurt, added chia seeds and an avocado pear. Why have only one type of pear when you can have two? I also made ginger an integral part of it. It provides a bit of additional flavour, plus some welcome zing and heat. The green element comes from kale as well as the avocado. This double pear green smoothie bowl recipe makes a really thick smoothie. It’s rich and filling and best eaten with a spoon, rather than drunk from a vessel. If you pour it into a bowl, it becomes something so much more than a smoothie in a glass. You’re almost compelled to sit down and sup it in a contemplative manner. This is so much better for the digestion than gulping on the run. I finished this particular double pear green smoothie bowl off with a sprinkling of my vegan honey & almond granola. This is not really necessary, but does add a little extra interest. It’s entirely optional and so far, I’ve only done it to impress guests. You will need a good power blender. Pears can be quite grainy and both ginger and kale are rather fibrous. I use my Froothie Optimum Vac2 Air Vacuum Blender,* which does a fabulous job of blitzing the raw ingredients into a velvety green smoothie bowl. It does it in about 40 seconds. No problem. 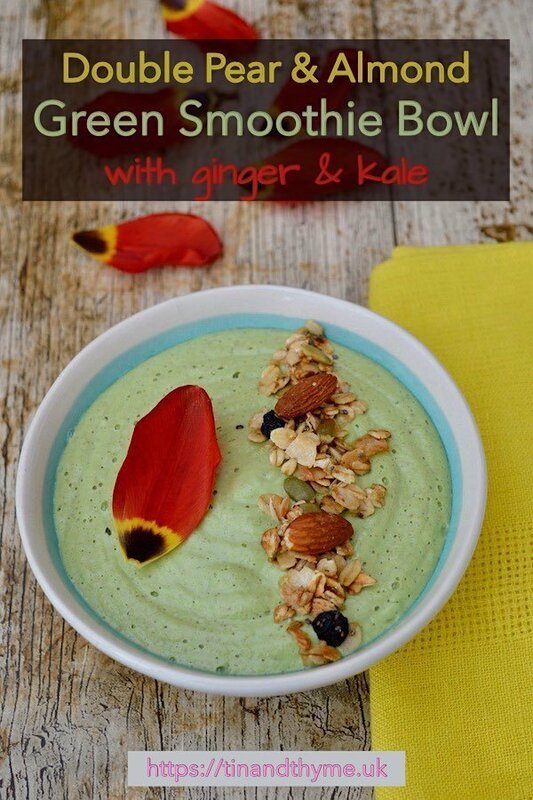 You can leave out the avocado and still have a delicious and nutritious green smoothie bowl. The mixture won’t be quite as thick or unctuous, but it will still be pleasing. If you don’t use the avocado and you’re not after a leisurely breakfast, you can drink the pear, almond and kale smoothie from a glass. If you’re not vegan, you can easily substitute natural dairy yoghurt for the almond version. I’ve been known to do this on a few occasions. When push comes to shove, however, I prefer to use vegan almond yoghurt. I like the idea of having three almond elements in this super tasty almond smoothie. For me the pear and almond butter are essential elements of this green smoothie bowl and should not be substituted. However, the ginger can be left out if you don’t have any to hand. It won’t have the slightly fiery notes that ginger gives, but it will still be delicious. I often substitute the kale for spinach in this double pear & almond green smoothie bowl. It just depends what I have in the house at the time of making it. The chia seeds, or sometimes linseeds, I add for a digestive aid as well as a bit of extra protein. They won’t, however, make any difference to the flavour and will only slightly alter the consistency. I’m sharing my two pear green smoothie bowl with Jenny at Apply to Face Blog for #CookBlogShare. Thanks for visiting Tin and Thyme. If you make this green smoothie bowl with pear, avocado, almonds and kale, I’d love to hear about it in the comments below or via social media. Do share photos on your preferred social media site and use the hashtag #tinandthyme, so I can spot them. For more delicious and nutritious recipes, follow me on Twitter, Facebook, Instagram or Pinterest. Green Smoothie Bowl. PIN IT. A delicious and filling smoothie, packed full of nutrients. It will keep you going for hours and two of your five a day are done and dusted by early morning. Bung everything except the granola, if using, into a power blender and blitz until smooth. This takes 40 seconds in my Optimum Vac2 Air Vacuum Blender. Pour into two bowls and sprinkle a little granola over the top if desired. Swap the kale for spinach or other greens of your choice if you prefer. This post contains affiliate links to Froothie Optimum products*. Links are marked with an *. Buying through a link will not cost you any more, but I will get a small commission. Thanks to my readers for supporting the brands and organisations that help to keep Tin and Thyme blithe and blogging. I am not a smoothie fan, but this one sounds and looks really GOOD that I even want to have some! I didn’t used to be much of a smoothie fan either, but they have become a breakfast staple for me over the last few days and I really like them now. This one is a particularly good one. Oh isn’t that pretty with the tulip petal? I think that is one green smoothie that I might just like as I’m a big fan of avocados. It’s very hard not to love avocados Janice. I know you’re not much of a smoothie fan, but this is really good. It went down well with my mother anyway. What a super healthy breakfast recipe! This would be perfect after my morning workout. YUM! Oh, I’m so impressed with your doing a morning workout Elizabeth. A delicious and nutritious smoothie is the least you deserve. I like the sneaky addition of kale for that extra boost of nutrition. This is quite a satisfying bowl. It’s filling and satisfying and delicious Jane and yes it’s always good to get some extra greens in. I love homemade smoothies, especially with ginger in and this one sounds delicious. Healthy smoothies can be oh so delicious. Do give one a try. And thank you for your very kind comment. Love the soothing and appealing colour of the smoothie. Wholesome, filling and healthy. Would love to try it, however, I don’t kale here so would need to replace it spinach. Thanks Mayuri. I’ve made this several times with spinach and it works a treat. The spinach makes the smoothie an even brighter green. Looks amazing Choclette, although I would rather drink it. So tasty! I am sharing this now! Go blender babes! Hahaha, I take it you’re not a fan of smoothie bowls Jac? This is very thick, so it might be a bit difficult to drink. But if you leave the avocado out, it will be fine. Indeed it does Anna. It’s become one of my favourite breakfasts – with or without the avocado. Love this, and also that it is a variation of my recipe, happy it inspired you! Just off to fetch more pears…. Your recipe is just fabulous Ceri. It made breakfast an absolute joy through Veganuary. This smoothie sounds delicious. I love the fact that you included some substitute. Knowing that avocados are seasonal fruit. This is perfect for those people who are in a diet. Thank you for sharing this smoothie recipe, will definitely make one. Let me know what you think if you do make it. Feedback is always useful.